Bring 1 cup of water to a boil in a sauce pan with tight fitting lid. Add ½ cup rice, cover, and reduce heat to simmer. Cook for 20 minutes or until the water is absorbed. As the rice cooks, in a separate sauce pan, bring 1 cup of lentils to a boil in 2½ cups of water. Cook for about 30 to 35 minutes, or until the water is absorbed. While the lentils and rice are cooking, grate the carrot and zucchini, and finely chop the red onion, garlic, and parsley. Set parsley aside. Bring olive oil in a medium sized saucepan to medium-high heat, and add carrot, zucchini, red onion, and garlic. Season with salt and pepper and cook until the onion is translucent – about 8 minutes. Set aside. Once rice, lentils, and vegetables are cooked and slightly cooled, combine lentils, 1 cup of cooked rice and the cooked vegetables into a large bowl. Add the parsley, flour, and flaxseed meal. Mix until evenly combined and add more flour to create a good ball rolling consistency if necessary. Roll into medium sized balls, you should get about 30. Form meatballs and begin to fry in pan with a thin layer of olive oil over high heat. Fry the meatballs on each side for 2 to 3 minutes or until browned. Set aside and keep warm in a 200 degree oven while you work on the carrots and pesto. Bring a large pot of water to a boil. Add carrots to soften them slightly, about 30 seconds. Remove from water and let sit until cool enough to handle. Place fat end of carrot into the spiralizer, using the largest noodle cut size your spiralizer has. Spin until you get about 3 inches from the bottom (if it's too hard to get that last bit, don’t try!). If you don’t have a spiralizer you can use a peeler to make peel noodles or a julienne peeler for julienned noodles. To make the pesto, pulse carrot and parsley leaves, cashews, garlic, and lemon juice in a food processor until coarsely ground. With food processor on, slowly drizzle in the olive oil and process until blended well. Add parmesan and some salt, and pulse until combined. 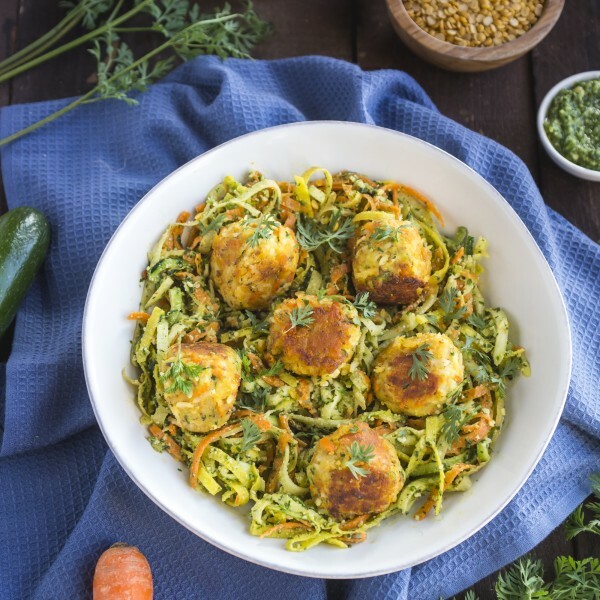 Dress the carrots in the pesto and serve with the meatballs.